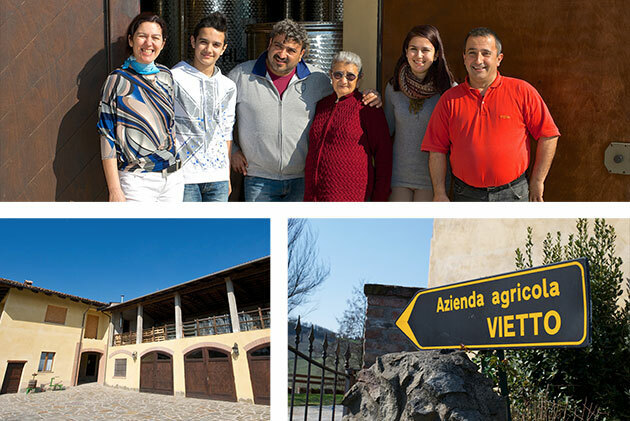 The history of our family began so long ago that we cannot remember any more: we remember how our father, Pietro, used to tell us how our family, as all farmers fifty years ago, only produced wine to be consumed in the family, with friends and to be sold to some buyer from the city. After the war our ancestors had the possibility to expand by buying the “Bric di Panerole” farmstead, where the present business is seated. It is situated on a hilltop that dominates the whole village and looks towards the Barolo, Novello and Monforte d’Alba territories. In the year 2000 we decided to renovate the business, planting new vineyards in disused corn fields, transforming the tractor shed into a cellar for vinification and bottling and exploiting the 17th century farmhouse as barrel and barrique cellar and tasting hall. Here, under the supervision of oenologist Piero Ballario, our dream came true: to produce wine from our grapes, maintaining the same simple and careful methods of winemaking that fully reflect this territory. The winery now has 17 hectares of vineyard and is divided into four kinds of grape varieties: Nebbiolo from Barolo, Langhe Nebbiolo, Dolcetto d’Alba and Nas-cetta from the Novello district. The family run management, enables us to manage work in the vineyards and in the cellar in a better way but above all, to have a direct relationship with the consumer that is always a welcome guest during visits, tastings and strolls along the rows of vines.